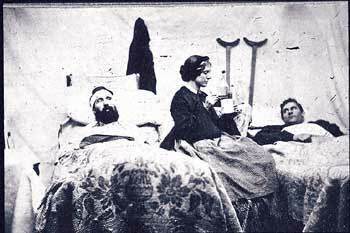 Today, we will discuss a lady who came to the battle area to assist with the care of wounded: Miss Georgeanna Woolsey. Georgeanna Woolsey and her mother arrived in Gettysburg believing their brother / son who served on General Meade’s staff was wounded. Happily, they discovered this was not the case and then Mr. Frederick Olmstead found them. Frederick Olmstead was in charge of the United State Sanitary Commission – an organization dedicated to providing medical assistance, good supplies, and camp and hospital cleanliness for the Union soldiers. Stockpiling supplies at strategic locations, the commission raced to battlefields to bring aid. Olmstead asked Mrs. Woolsey and Miss Georgeanna if they would establish and oversee a Sanitary Commission camp near the railroad station in Gettysburg. The ladies quickly agreed. What prompted Olmstead to request these ladies’ assistance so readily? The Woolsey family was dedicated to the Union cause and staunchly supported the abolition movement. Georgeanna, a few of her seven sisters, and her mother volunteered as hospital nurses or took other roles with the Sanitary Commission. Although it was shocking to society, Georgeanna walked from her beautiful home, went to a base hospital, and trained to serve as a nurse. Her descriptions of her early hospital experiences are forthright and she described her inexperience, fear, and shock. But she learned and was sent to Virginia in time for the first battle of the war. The Woolsey family supported Georgeanna’s decision, but decreed that at least two Woolsey ladies would serve together – mother and daughter team or sister teams stepped out and entered the war zone hospitals. Georgeanna became a competent, compassionate, and skilled nurse; she was also good at overseeing the management of a chaotic hospital. Thus, when Frederick Olmstead asked Georgeanna to establish an aid station, he knew he was asking one of the best qualified women. The soldiers then came to the Sanitary Commission camp and surrendered to the care and compassion of the Woolsey ladies and their assistants. According to her account, Georgeanna estimated that nearly every soldier who left Gettysburg stopped for at least a meal at her tents. Impressive! Georgeanna and Mrs. Woolsey were at Gettysburg for three weeks. Afterward, Georgeanna wrote a pamphlet about their experiences, hoping to inspire other ladies to redouble their efforts to aid the soldiers. Mrs. Woolsey and her daughter served as nurses until the end of the war and visited Richmond shortly after the conclusion of the conflict. Georgeanna married a doctor she had met during the war and together they founded a nursing school. She wrote a nursing handbook and spent the rest of her life actively advocating aid for children and the poor. Thanks for sharing this information! Miss Alcott’s account is very interesting and shares a lot of good information about a nurse’s role in a Union base hospital.